As I write this, it’s hailing in London. Hailing in April. I want a holiday. I need a holiday. I just need to be somewhere else for a bit, sand burning my feet and sea water between my fingers, or a little wooden cabin with a view of barren, pointy mountains, it doesn’t really matter. 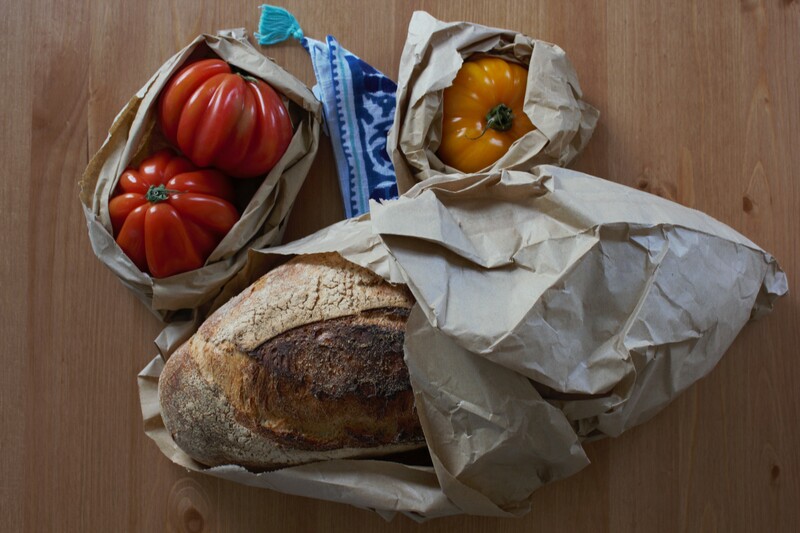 Things always seem so simple on holiday, as if life, stripped of all its mundain aspects – the cleaning, the shopping, the commute to work- shone it all its book-reading, epiphany-laden true glory. A holiday is as close as I get to understanding the true meaning of life. So I make myself something that reminds me of home, of warmth, of the aromatic smell of rosemary and sage. When you live 900 miles away from the place you grew up in, you do silly things like overpaying for the brand of ricotta your mum buys, even if you can’t really tell the difference. You start craving things you never even knew you liked that much, like a specific brand of breakfast cookies that was always, always in your cupboard. There are a few things I make myself when I miss home: pasta with cherry tomatoes, with lashings of olive oil and basil, sweet and tart and happy like a warm summer evening. And my mum’s pasta with tuna, made with the canned sort, speckled with chopped parsley; or a fiery, warming arrabbiata sauce. But sometimes, I crave something that I never even really understood in the first place: a caprese salad. Often eaten at the seaside, when normal people seem to think it’s too hot to eat hot food (not me – happy to have lasagne in 40°-degree Rome), it also features in laminated menus of tourist-trap restaurants: perfect rounds of white, dry, bland mozzarella; equally perfect rounds of watery tomatoes, big basil leaves. My version is served on toast, good toast, sourdough from Bread Ahead – but frankly, you could put this on any form or shape of crusty bread. 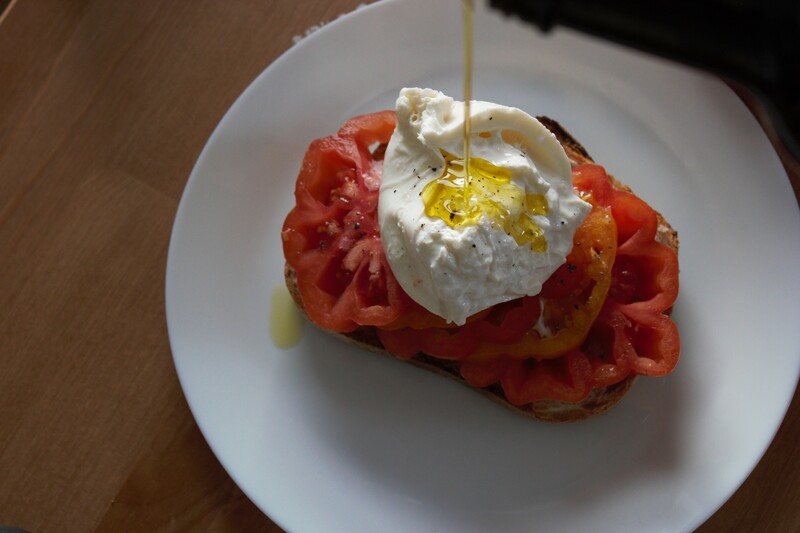 It’s thin slices of ripe, colourful tomatoes, maldon salt and pepper, amber-coloured olive oil and half a burrata. Because, I mean, why buy mozzarella when you can have its creamy, velvety cousin? I thought so. 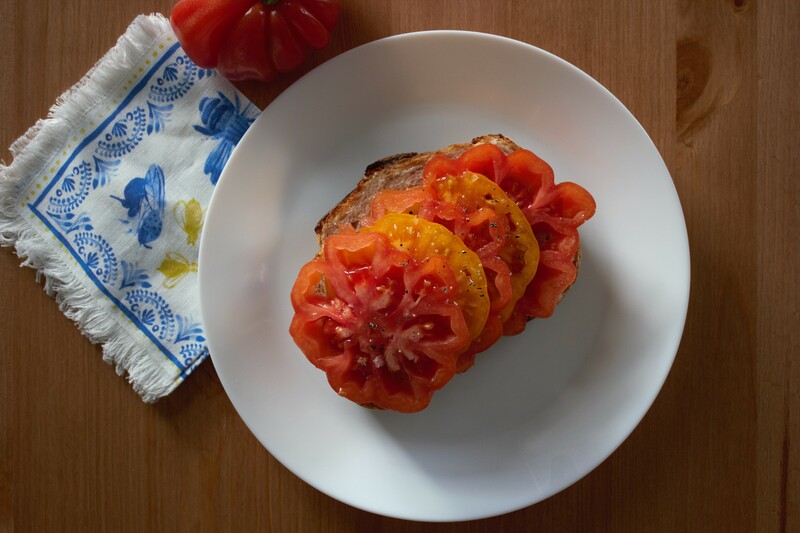 Slice the tomatoes thinly, arrange on the bread and place some burrata on top. 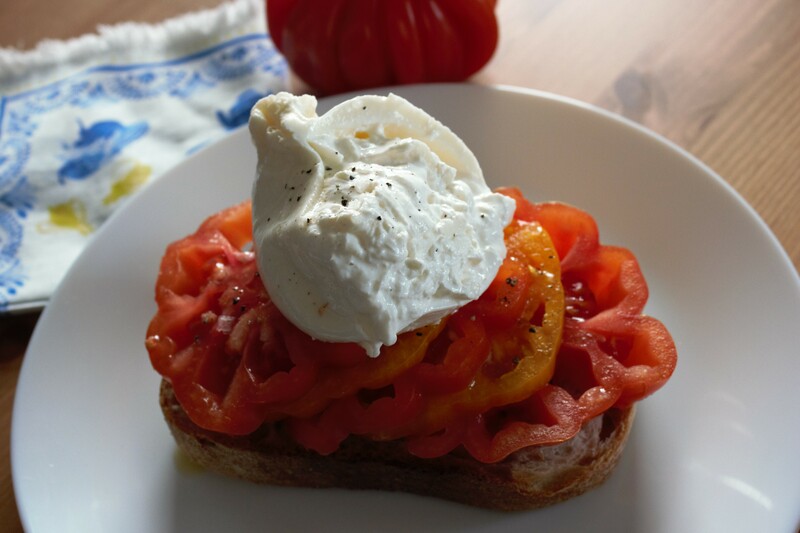 You could also use the creamy burrata as the first layer of this open face sandwich. Add some olive oil, salt and pepper. Previous Post Marmite Toast. No, really.